New material, soft and very durable. Once used, you can throw them away or recycle them. On the other hand, depending on the user's preferences, you can keep them for up to three weeks, if not longer without direct contact (i.e. by placing a fitted sheet over it). "Ever Clean," they are wrapped in individual packaging. 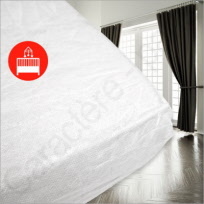 Perfect for hotels, motels, hostels, inns, B&Bs, day cares, children still learning potty training, unexpected visits from friends... Anti-allergic material, which is effective at preventing the spread and breeding of lice, bed bugs, bacteria and dust mites in mattresses. This Delux Luxury line is different in that the material was designed to contain an additional layer of softness, all the while permitting the breathable feeling essential when sleeping. In addition, these two layers provide a better seal and protection from leakage that an our other non-waterproof linens. The Deluxe Luxury Line is an ideal compromise between the classic yet uncomfortable plastic layer and newer products' technological innovations. This fabric will shield against 80% of leaks, but is not recommended for those with serious incontinence problems. Material: Cool, breathable fabric that won't provoke sweatiness. Quantity: 20 pieces, each with individual packing. Small Cot, 60 x 120 cm x 13 cm / 24" x 47" x 6"
Normal Cot, 70 x 140 cm x 13 cm / 28" x 55" x 6"
Powered by ShopFactory to sell P228 online. All-in one eCommerce and online shopping cart software.